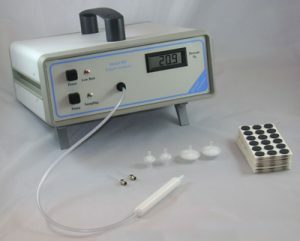 The Model 905 is used for the measurement of residual oxygen in food packages. With an expected oxygen sensor life of 4-5 years, it vastly outperforms other oxygen analyzers with a cheap sensor that might last 1-2 years. Use it in the lab, or on the packaging line. While the performance and functionality is the same as our Model 901, the Model 905 is the better choice for conducting testing when the operator is stationary. This is primarily due to its tip up feet, and form factor. Also, its high end rugged metal enclosure ensures its overall durability. The sample probe is tipped with a particulate filter and syringe needle. Affix the foam septa to your package, insert the needle through the septa, and press the pump button. Sample from your package is drawn through the probe and into the internal oxygen sensor. The pump will draw about 5 cc/second from your package. The pump will run from 2 to 12 seconds and this time is easily adjustable using the controls. This adjustment is especially important for packages of varying size, or for rigid packages. The oxygen measurement displays on the LCD within 15-20 seconds. The Model 905 oxygen analyzer is the market leader for durability, simplicity, and reliability. The initial lower cost, and longer-life sensor, makes it best in class for laboratory package oxygen analyzers. The sensor is unaffected by high levels of background gases such as nitrogen or carbon dioxide, and unaffected by trace hydrocarbons. You can use the Model 905 for applications where oxygen level is very high (50 to 100%) without overloading the sensor. The expected oxygen sensor life is typically 4-5 years, unlike other analyzers with a sensor that last 1-2 years.